GTA Car Kit for Honda Accord 2003, 2004, 2005, 2006 and 2007 is all you need to integrate your smartphone, tablet or mp3 player with your stock car stereo system. Active satellite radio is not supported – as GTA Car Kit is using the same port as a satellite radio, it is not possible to have them both active. 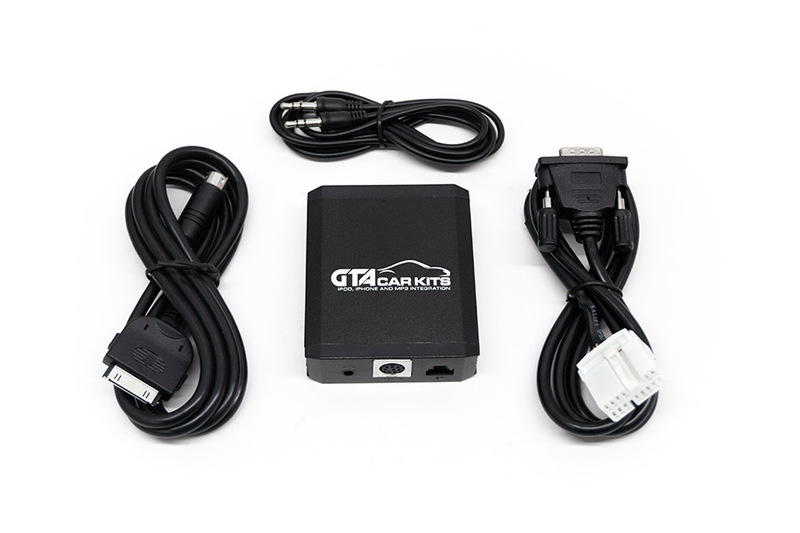 Therefore you will have to disconnect your satellite radio during GTA Car Kit installation. As someone who thought they’d have to purchase a new car just to have bluetooth connectivity…I am so happy that I found this car kit. Originally, my radio (original Honda radio – non satellite) was connected to a third party iPhone-compatible cable via the CD changer port that provided CD quality audio, but I wanted something wireless. I was nervous about having it removed and replaced with a bluetooth kit. I purchased the Bluetooth kit for my 2004 Honda Accord EX, and I took the kit to my local dealership. After it was installed, I drove around town for a while to test the audio (because I love my music). The sound quality is excellent and sounds the same as the CD player. I wanted to leave a review because… for those of us that love our music but have older cars, this is a life saver. I installed the “Pure Bluetooth with AUX” kit in my 2005 Honda Accord. Installation was fairly easy, just took some extra time to make the connection to my jack on my cd system, because my jack plug is on the back vs underneath the cd system. I’m now able to receive and make phone calls thru my car using the bluetooth feature. Phone calls are extremely clear, the calls on this system are just as clear or clearer than my late model 2013 and 2016 vehicles. Streaming music and Aux music is extremely clear and crisp (CD quality sound or better). Steering wheel and stereo controls for phone calls, and music works well with the system. I wish I had seen this system sometime back I could have been enjoying the bluetooth feature of phone calls, streaming & aux music in this vehicle way before now. I highly recommend this as a great solution to updating your audio system to become bluetooth enable to allow your audio system to take advantage of later technology. It came early and was so easy to install. My 11 year old son and I watched the video twice and then installed the unit together in about 45 minutes. While we ran the mic up the driver’s side pillar, we also ran the usb phone charging cable to that side because that is where I put my car phone mount. My son’s small fingers came in handy to run the wires, if I didn’t have him I would have just used needle nose pliers. It’s been 4 months, this product is perfect. No issues, easy install. Would definitely buy this product again. I got Bluetooth version for my honda with Navigation,it took only few minutes to install. Just follow videos instructions. Great unit, works as advertised. Highly recommended. Installed this in my 2006 Euro Accord today. Had to go through a few extra steps. The ash tray had two extra plugs for a LED and a open/close sensor, which was a simple plug just like the 12v socket. The compartment under the stereo was a bit different and was mounted with 4 10mm bolts under the trim. Apart from that it was like the instruction video, plug was easily accessible right underneath the stereo. Works like a charm. I picked up Bluetooth kit the other day (Bluetooth kit for 2007 Honda Accord – mine is a US model with Sat radio & no Nav) – followed the instrucions and was up and running in no time. Sound quality is simply amazing – for both: playing audio or talking on the phone. No interference, no noise, very clear conversation – mike installed in the pillar just like suggested on the instrucional video. 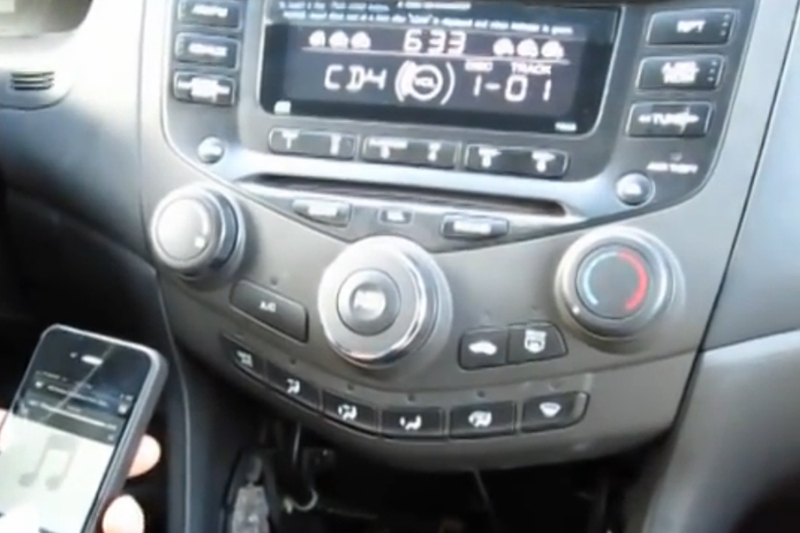 The phone conversation quality is actually clearer than on my other vehicles – 2013 VW Golf TDI and 2015 Subaru BRZ – and those both cars came with factory installed Bluetooth. What is even more impressive that I can pickup or drop the calls using both: “audio track ” button on the radio as well as “channel ” button on the steering wheel – this is way beyond what I was expecting and makes for truly safer driving experience!!! I was a little skeptical on buying at first but I went ahead and went with it. It took me about 30 minutes to install and the sound quality was great. I made the mistake of buying the AUX cord and not the bluetooth. I had used the device for about a month before the cord shorted out on me. I was not rough with the cord and barely moved it while using it. I am just thinking the cord was cheap. I wish it still worked because the sound quality was awesome and it was easy to install. I was very happy with this kit! It preformed as advertised and I have no issues with it! The installation is slightly different in the Honda Accord with Navigation vs. no Navigation. The installation for accord with navigation requires the navigation unit to be pulled out. There are videos on YouTube on how to remove the Navigation unit. The amount of force required to remove some of the parts felt like something was going to break but nothing did and everything worked out. Installation took approximately 1 hour coming from someone with no experience and watching YouTube videos while doing it. Ok. I usually do not do this, and I was so doubtful with this equipment. I legitimately thought the reviews were fabricated and written by the company themselves to promote the product. They all sound so generic, and “too good to be true,” but I really needed bluetooth in my car, so I pulled the trigger. LET ME TELL YOU: TRUST ME, This equipment is amazing and works wonderfully. All the reviews that say, “oh I’m a girl who has never touched my car, and i can install this super easily in 30 minutes” IT IS TRUE!! (I am a male, however) I bought the little car orange tools that help the panels snap out of place from amazon for $4, and just used a regular screw driver sitting at home, and that was all that is needed. SUPER easy to take out the panels and install this thing. I thought the mic would be really complicated to install, and debated whether I wanted to go thru the pain to install that, but I tried it and that was easy as well. Something to note: When taking out the panel that is under the Gear handle thingie, make sure that the tool you use to snap it out of place does not scratch that shiny plastic (if your car has the shiny plastic panel that says the PRINDL)! Might want to put some cloth between the panel and the tool. I have a 2005 Accord with navi/XM so the installation process was a little more…. difficult? I had to pull out the entire radio, because the port was in the back instead of just hanging down like in the video. I did it on a weekend that I worked, so I finished it in 2 days in 10 or 30 minute increments (my breaks lol). I had to use a multi-pack of trim removal tools (ESSENTIAL), a couple Philips screwdrivers, and a 9mm wrench for some bolts at the bottom of the radio unit. I’m a 17 year old girl and I did everything myself. It took me a while, but it was worth it!! The sound quality is just as good as a CD and it’s so easy to use once everything is hooked up and put back together!! I ordered over a holiday weekend and it came in less than a week. (: My friend keeps telling me he’s gonna buy one for his car and pay me to install it for him lol. The kit is fantastic, easy to install even for an old lady! Also very impressed by the short time it took for the kit to arrive to Sweden. Ordered it on April 5th and had it in my hands by April 12th. And no additional tax charges. Thank you so much for the instructional video that made it possible for me to do it myself. The only problem I have with the GTA Car Kit is that it could not get to me fast enough. I tried other methods of connectivity and nothing worked up to my satisfaction. The instructions were simple and the video was a lot of help on a visual level. It took me Thirty minutes at night and I can’t wait until tomorrow to ride around with the bluetooth connection with the crystal clear sound. I can’t stress enough how easy this was to install! I’m a 23 year old female who generally relies on males for help in this department, but everyone told me to pay to have it installed because of the “risk” of damaging my car. Everyone I talked to for pricing for installation told me it would be another100-150 bucks. I figured I’d try on my own first.. So glad I did! About 30-40 minutes (being as thorough as possible) and I was totally done! Everything out, checked that it worked and everything back in! I highly highly recommend this kit! I received the kit on Saturday 14th 2015 and installed it over the weekend. It took more time to remove the radio than to install the kit. Finally I can hear all the music on my IPOD NANO in the car . All functions available as expected. The sound really has CD Quality! Actually I can’t hear the difference between IPOD and car kit ! Wireless streaming from my Samsung is just perfect! This kit is well worth the money. My 2004 Honda Accord has a factory receiver. Ever since I purchased my first iPhone a few years ago, I’ve wanted to have the ability to access my iTunes music in the car. I’ve installed audio systems for numerous other cars over the years, and considered upgrading the Accord. When I first researched replacement solutions for my Accord, I learned that the entire head unit would need to be replaced, as there were no aftermarket solutions that would integrate with the factory unit without the GPS or Sirius/XM features. The only alternative was an $80 FM wireless transmitter that I installed. It was the best they offered at the local audio shop, who’s won national awards for their custom audio installations, but being transmitted through FM, the audio quality was not great. I recently searched for a replacement head unit for the Accord when I found GTA Car Kits. The price for the Pure Bluetooth solution was reasonable, at less than half the cost of an aftermarket replacement head unit. The shipping was quick. And GTA Car Kits had a step-by-step setup video for my specific car that made installation super easy. Everything covered in the video was exactly as it was in my car. The Pure Bluetooth audio solution was easy to install because it attaches directly to the factory receiver using a pre-made connection block, designed specifically for the factory receiver. It literally was plug and play. One connection, that was all. The system works exactly as described in the installation video and the audio quality is as good as if the factory unit actually came with Bluetooth – as good as popping a CD into the drive! I am absolutely satisfied with the Pure Bluetooth system and highly recommend it to others. Purchased the Pure bluetooth for 2004 Honda Accord. Received within 3 shipping days. Less then 30 minutes to put the kit in and very easy when following the video. Bluetooth connects cleanly and quickly sound is very clear. Best thing is the steering controls work for volume and answering the phone. Works just like advertised. Thank you gta car kits. Also if you have xm radio make sure you get the extra plug wire. It costs a couple dollars more but you don’t loose anything. 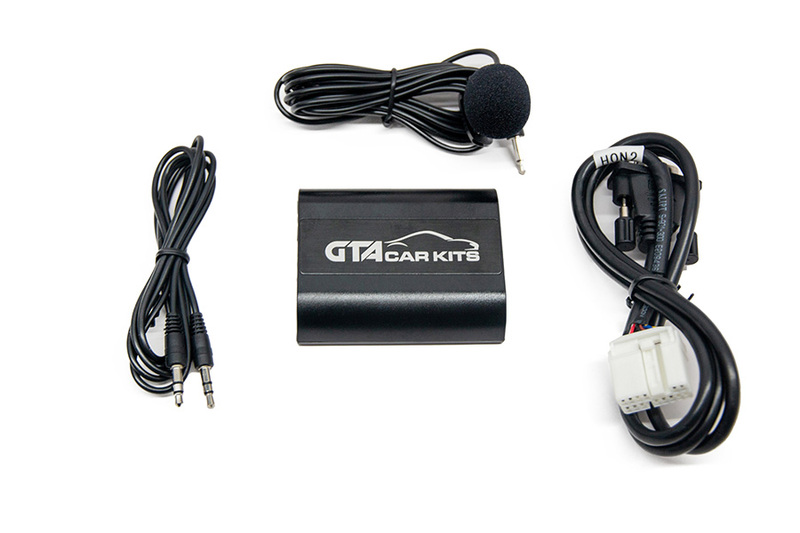 You wont loose ability to use your cd player with this gta car kit unlike a lot of other car kits on the market. Next Im gonna get the Bluetooth. Had a 65 degree day in mid January here in Kansas, so I thought I’d install the kit today. I prepared for a long complicated install. I watched the install video, but was a bit apprehensive. It looked too easy. Could not have been any better! I had all my tools ready, including the magnet, which I needed. 30 minutes, start to finish and my daughters car had the XM radio, which is just a bit different on the wiring. Thank You to GTA and the young man who did the install video. I just installed this kit in my daughter’s car and, I gotta say, it was soooooo easy to do! And, she LOVES it!!! I gotta give a shout-out to the maker of the video as it was very easy to follow. Great product and will recommend it to everyone. Thanks GTA!!!! This video saved me so much time, and money, as did the car kit itself. Everything works great! Only issue I noticed was the iPod cord came out when I was trying to put the cubby back in, and tested my iPod again. I took the cubby back out (good thing I didn’t screw anything back in and thought to test it one more time) and taped the cord to the kit in a criss-cross style to hold it in place (I used electrical tape), I bought the Bluetooth Extension too, but didn’t feel like putting it on yet (since it was so easy to do all of this, I don’t mind having to do it over again if/when I do feel like putting the Bluetooth in). I think altogether this took me, maybe, 30 mins to do from start to finish. I drilled the hole for the cords in the cubby on the bottom back left hand side, since I put the car kit on that side at a 45* angle. Oh, for reference, I’ve never done anything like this or remotely similar. I usually just add washer fluid, fill the tires, and change the wiper blades, so I have no experience with this whatsoever. That being said, getting everything set up was incredibly easy and it sounds great. Thanks so much!! My kit just arrived and went in to my 2007 Accord LX in under 30 minutes. Working great. Super easy install…can’t believe I waited this long. Thanks GTA! I got the GTA car kit to put in a 2004 honda accord EX-L. It works great and my son (who drives the car) loves it. We followed the video with no issues. However, when we got to the part where you find the port to plug the cable in; it was not there. This car has the Satellite radio option and port is on the back of the radio. (not on the bottom like the one in the video)If you have the same, just plan on some extra time to get the white plug out because there isn’t much room to get it out. Once you get it out you replace the plug with a white y cable. The rest should be the same. I just purchased the GTA car kit and bluetooth accessory adapter for my 2007 honda accord, and it’s AMAZING. I was skeptical at first because it was so inexpensive for what I was getting, but the product is great. It has crystal clear sound for both myself and the person on the other end of the call… the music through bluetooth works great with my iPhone 5S. I connected my iPod nano (with though screen) to the adapter, and it works great. Installation only took be about 20 minutes. I watched the youtube tutorials that are provided a few times, so I had a good idea what I was doing when I got into my car. We also have a 2009 Toyota Prius that I am going to buy this kit for. I can’t wait to try it in there as well. Great product! I HIGHLY RECOMMEND! One year ago, I purchased the GTA Car kit for my 2007 Honda Accord. It works great and took less than 20 minutes to install. I was on the GTACarkit website today to purchase the bluetooth connection as that was not available when I purchased the kit. I had one issue that was probably caused by me or my daughter pulling the 3.5 mm jack to plug in a device. The 3.5 mm jack was not fully plugged into the GTA Car kit module. Someone suggested taping this in so it doesn’t get pulled out. After reconnecting the 3.5mm, one thing I changed which was suggested by someone is moving the module back to near the middle storage box between the seats and drilling the hole in the front of that so the wires come out of that. The module sits under the cup holders and the 3.5mm and IPhone jack come out through there. This allows the front storage box to close with no wires coming out of it and it moves the cords back where a person(My daughter) in the back seat can connect their device and control the music. The decision to allow my daughter to control the music has been questioned several times. This video saved me so much time, and money, as did the car kit itself. Everything works great! Only issue I noticed was the iPod cord came out when I was trying to put the cubby back in, and tested my iPod again. I took the cubby back out (good thing I didn’t screw anything back in and thought to test it one more time) and taped the cord to the kit in a criss-cross style to hold it in place (I used electrical tape). I bought the Bluetooth Extension too, but didn’t feel like putting it on yet (since it was so easy to do all of this, I don’t mind having to do it over again if/when I do feel like putting the Bluetooth in). I think altogether this took me, maybe, 30 mins to do from start to finish. I drilled the hole for the cords in the cubby on the bottom back left hand side, since I put the car kit on that side at a 45* angle. is awesome. 😀 Oh, for reference, I’ve never done anything like this or remotely similar. I usually just add washer fluid, fill the tires, and change the wiper blades, so I have no experience with this whatsoever. That being said, getting everything set up was incredibly easy. I am soo satisfied with this product. I received quickly and installed myself (female and all). But I had emailed you guys a little while back and you assured me a full money back guarantee. Very easy to install & great quality! I just wanted to say thanks for making such an awesome product. I’m very much a girl that believes on paying people to do things right, but I saw your YouTube tutorial on hooking up the car kit and although the task seemed daunting I was determined to give it a try. A company here in Connecticut offered to hook it up for $125 but I thought I’d give it try. In about 30 minutes, I was able to remove the center pocket, hook up the kit, drill a hole in the pocket, and put everything back together. With the proper tools, there’s no damage to my vehicle and for the first time my iPod sounds great no matter where I drive. You’ve made this customer extremely happy and I am spreading the word! But I couldn’t do it in my ’04 Accord. Your kit did the job perfectly – thanks! My daughter found out about GTA Car Kits on the Internet. We tried transmitters, and considered after-market radio replacement. The transmitters worked poorly, especially in urban areas, and radio replacement was expensive and ruined the factory look of the dash. The GTA kits looked simple to install and use. Very easy installation. It took about 15 min to install. No unusual tool were required. The video was a great help both for installation, and as a way to understand the unit before purchase. We use iPod Touch. On both cars, the cables were run to the box under the radio. I didn’t see anything needing improvement. It’s a well thought out and constructed unit. Overall, it was a great experience. I installed them in my daughters cars, and haven’t heard of any complaints. I believe they work just as expected. I found your product on Youtube. I think I saw another product on Youtube but it looked a little cheap, so I picked you. The shipping was fine. Installation was very straightforward and was very quick. I bought a drill and a unibit to create the opening for the cables. The installation video on Youtube was great, very to-the-point; I thought it would be a lot more difficult to install something like this, but it was actually really easy to do. I use an Apple iPod (6th generation). I ran the cables through the top of the center cubby, pretty much like in the video. I am really happy to being able to get rid of my FM iPod transmitter which was awful in general but especially on long car trips when I had to change radio frequencies because I’d drive into an area where the frequency I was using was for some radio station and sometimes empty frequencies were hard to find. I really liked the instruction video. I also like how the iPod jack also charges the device while you use it. I’m really happy with the end result, and the installation was actually fun! I love you. I watched the video on how to install the car kit like 4 times, got the car kit in 2 DAYS, and had it hooked up within 10 minutes. 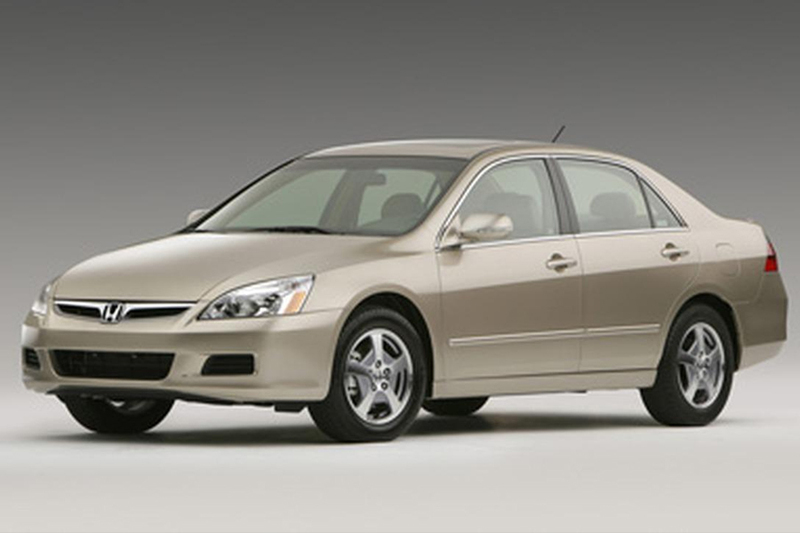 I have 2005 accord. I just layed the converter box to the side and ran the cables through a hole I drilled on top of the center pocket. Great Buy! got it last week and took some time emailing to make sure everything was all good and you guys were a great help! Awesome kit. same price as multiple parts for JUST an aux. and even better with sound quality and set up. It was so good I found this page just to write a review. Very Very satisfied!! THANK YOU GTA CAR KITS! Hi there. I just installed the car kit an a honda accord 2003 with navigation system and it works really good. I had some problems when I started the installation.. the connector for the new cable was’t there, so I look and look and it was to my left side of the radio (white)hanging right there in a harness loop. I checked the shape of it and it was the right one. It was the male side and I order the extra Y cable for navigation system the female side. All I can said is that it works better than one in Best Buy. I had the one from Best Buy and that one connects to your antenna so you will lose some of your radio stations..
amazing kit i got it just this afternoon like an eager kid and actually installed it in 10 mins . given that i removed the parts the night before . amazing quality and sound that it produces CD quality and its very simple and compact….. i highly recommend it. oh one thing get yourself a magnet cuz it took me almost an hour to put the last 2 screw back in cuz it? kept falling on me …but the GTA car kit for the accord is highly recommended wonderful product. Just wanted to let you know that your product is fantastic. It does what it is supposed to. I really like the hybrid mode. The YouTube video is really helpful too. I installed the kit in 30 minutes on my Accord 2006 and I’m enjoying the music from my iPhone4 in the car.